It’s a dark ‘n stormy day when the rum runs out, but lucky for all of us there will be plenty to go around on August 16. Today, we pay tribute to the currency of the Caribbean as we celebrate National Rum Day. It actually makes sense why the rum’s always gone — it’s a delicious spirit that springs from swaying palm trees and sugar white sand. The earliest rum distilling companies can be traced back to the 1600s, when sugarcane was cultivated and its byproducts were used to create the drink. Thanks to British exploration, rum runners, and new economic trade routes, rum took the new world by hurricane. It was made famous by both pirates and the British Royal Navy, and remains a mainstay cocktail base to this day. Fortunately, now we can all enjoy this drink without the threat of scurvy. The days are getting shorter and school is right around the corner, so why not have one last summer bash to celebrate the season? Take advantage of the many tropical and summery drinks that are easy to make, and impress your friends with your Caribbean concoction abilities. Adding in a pirate theme is always nice, and you can be sure the kids will enjoy a house full of Jack Sparrows, too. 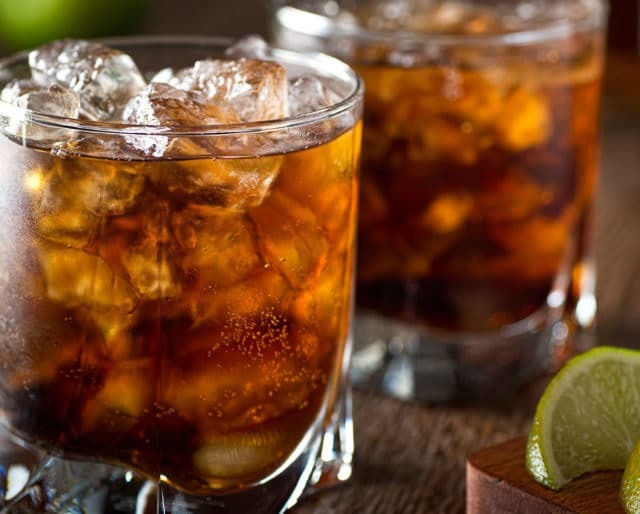 If you’ve been a Cuba Libre fan your whole life, do yourself a flavor, be bold, and try sipping the spirit another way. Traditionally, white rums were for mixing, while dark rums were for having on ice, or neat. Find a rum tasting to attend, or even have your own with a few friends, and see how it feels to branch out. Want to take your rum like the original sailors and pirate of the high seas? Go naval and try making “grogg,” which the Royal Navy made by simply mixing rum with beer or water. For a slightly sweeter treat, take the advice of the pirates: Mix rum with your own assortment of water, sugar, nutmeg, citrus juice, or grenadine to make Bumbo. Then, you’ll see why the pirates sang rum’s praises. There’s much more to rum than just mojitos and daiquiris. It’s the basis of the tropical punch mai tai, and the party favorite Cuba Libre (rum and coke). Rum Swizzle, Blue Hawaii, and Zombies are all drinks your local bartender should know how to cook up. So if you like piña coladas, try branching out next time. You won’t be disappointed. While we typically think of rum as the perfect drink for summertime, it can be mixed appropriately for any time of the year. As fall arrives, grab some in-season pears to make a Pear Naked Sailor with spiced rum. For the coldest days, a Hot Buttered Rum will warm the spirits, and you can welcome the warm weather again in the spring with a tropical Yellow Bird. Perhaps English master poet Lord Byron said it best, summing it all up as “there’s naught, no doubt, so much the spirit calms as rum and true religion.” Since it came on the scene in the 1600s, rum has been the inspiration for sailor’s songs and pirate’s codes, created booming economies, and helped us party island-style. Let’s be sure to celebrate this tradition right on August 16.